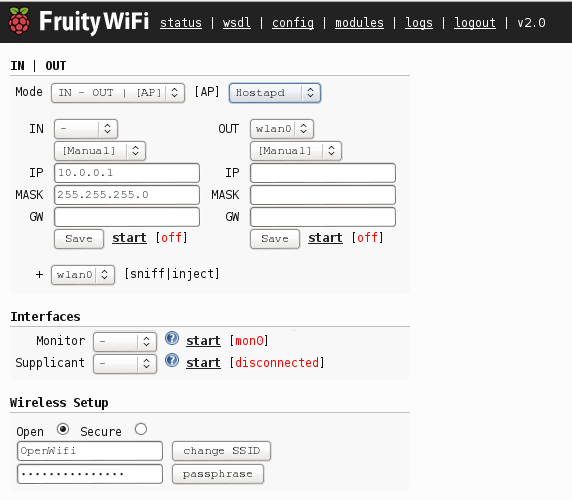 FruityWifi is a wireless network auditing tool. The application can be installed in any Debian based system adding the extra packages. Tested in Debian, Kali Linux, Kali Linux ARM (Raspberry Pi), Raspbian (Raspberry Pi), Pwnpi (Raspberry Pi), Bugtraq. Web-Interface has been changed (new look and feel, new options). Nginx has replaced Apache2 as default webserver. Installation script has been updated. Config panel has been changed. Network interfaces structure has been changed and renamed. It is possible to use FruityWifi combining multiple networks and setups. Supplicant mode has been added as a module. 3G/4G Broadband Mobile has been added as a module.